On-board MAX485 chip is a low-power and slew-rate-limited transceiver used for RS-485 communication. It works at a single +5V power supply and the rated current is 300 μA. Adopting half-duplex communication to implement the function of converting TTL level into RS-485 level, it can achieve a maximum transmission rate of 2.5Mbps. On-board MAX485 chip is a low-power and slew-rate-limited transceiver used for RS-485 communication. It works at a single +5V power supply and the rated current is 300 μA. Adopting half-duplex communication to implement the function of converting TTL level into RS-485 level, it can achieve a maximum transmission rate of 2.5Mbps. 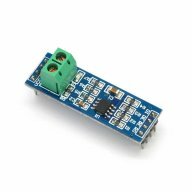 MAX485 transceiver draws supply current of between 120μA and 500μA under the unloaded or fully loaded conditions when the driver is disabled. The driver is limited for short-circuit current and the driver outputs can be placed at a high impedance state through the thermal shutdown circuit. The receiver input has a fail-safe feature that guarantees logic high output if the input is open circuit. In addition, it has a strong anti-interference performance. Dieser Artikel wurde am Mittwoch, 12. Februar 2014 im Shop aufgenommen.